The Boston Avenue Methodist-Episcopal Church in Tulsa, Oklahoma. 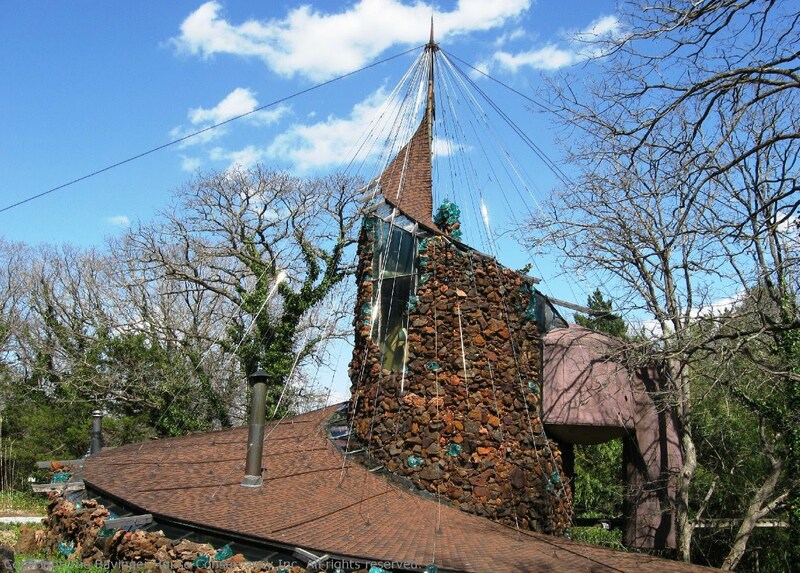 Perhaps no Twentieth Century American architect was as fearless as Bruce Goff. His only parallel in the art world might be to outsider artists today. 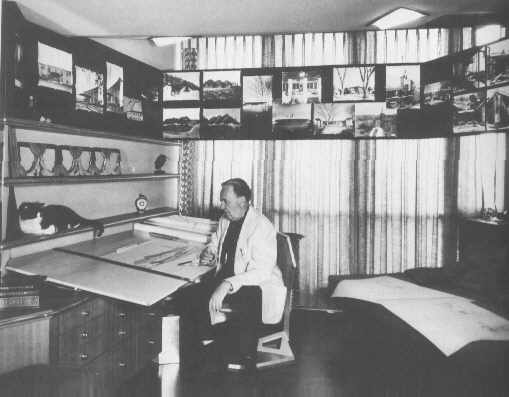 Architect legend Frank Lloyd Wright even advised him to avoid studying at an architecture school or risk losing what made him Bruce Goff in the first place. But though he remained classically unschooled, he became so proficient in his art that he was appointed head of the Architecture Department at the University of Oklahoma. Goff’s father, Corliss Arthur Goff, was a jeweler from Cameron, Missouri. He started a jewelry and watch repair business with one of his brothers in Hays, Kansas, around 1900. He opened his own shop in 1903 in WaKeeney, Kansas, and married Maude Furbeck, a schoolteacher from the nearby town of Ellis. They later moved to Alton in Osborne County, Kansas, where their son, Bruce, was born on June 8, 1904. Bruce Goff lived in seven different towns in Kansas, Colorado, and Oklahoma before arriving in Tulsa in 1914. He was self-taught and began his architectural career at the age of 12, when he became an apprentice for the firm of Rush, Endacott & Rush of Tulsa, Oklahoma. As Goff later recalled the episode, his father stopped the first stranger he met and asked for the name of the best architect in town. Given the answer Rush, Endacott & Rush, young Goff was marched into their office by his father, who produced samples of his son’s drawings. Goff had no idea then of what an architect was, but was told by A. W. Rush, the senior partner who met them at the door, that he could be one if he wanted. Early designs by Goff showed an artful comprehension of the Prairie idiom. Yet one of his only remaining houses from 1920 would have seemed equally suitable in 1960. His designs were being built by the time he was fifteen, and in 1929, when he was 25, he became a partner in the firm. 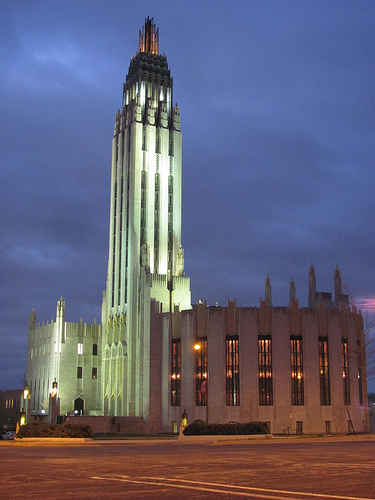 Barely in his mid-twenties, Goff designed the most spectacular modernist church to this day, Tulsa’s Boston Avenue Methodist-Episcopal Church on Boston Avenue. Now regarded as an Art Deco icon, it predates the Chrysler Building in New York and the Emerald City on celluloid. But he would soon tire of this stylistic language in favor of a more international modernism. Resembling Wright’s Usonian period, his houses from the mid thirties are spare and simple, but his drawings of them were elegant graphic statements that went beyond practical design necessity. To Bruce Goff, architecture was as much about drawing as it was about music, sculpture and dance. It also wasn’t about learned formulas that were applicable to any job at hand. Architecture was about now. 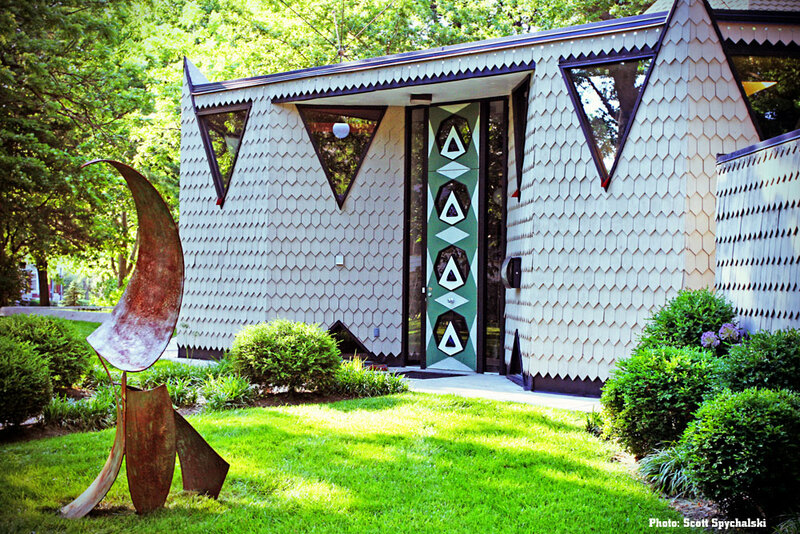 The Eugene Bavinger Home in Norman, Oklahoma, designed by Bruce Goff. Goff went into the armed forces as a Seabee in World War II, allowing him to travel to California, Alaska and the Aleutian Islands. Because building materials were scarce, he created barracks, chapels and mess halls using simple military materiel. He seemed to find the purely utilitarian supplies liberating, fabricating Quonset huts into exercises in geometry beyond the usual bare bones of the structures. Goff’s architectural style, known as “Imaginative Design” by his peers for lack of more expressive words, was considered to be at once both shocking and revolutionary. However, over the years his genius became universally recognized and he is now revered among American architects second only to Frank Lloyd Wright. Surprisingly, most of Goff’s work centered in Oklahoma and Kansas along with more urban areas such as Chicago, Illinois. His clients, who included auto dealers and turkey farmers, always exulted in the uniqueness of their homes. In his lifetime he was named to Who’s Who in America and to Who’s Who in Architecture. 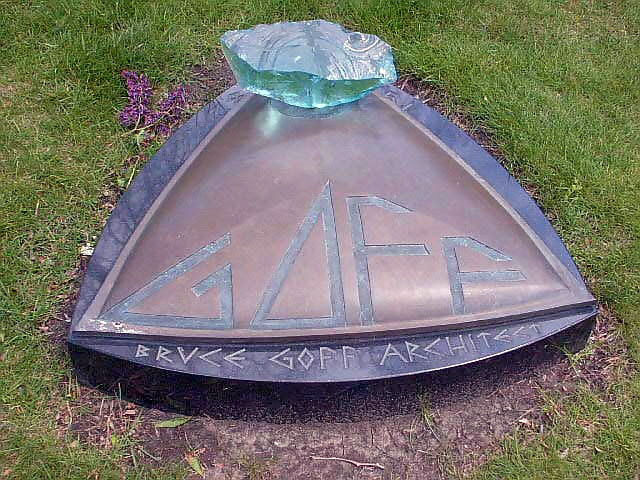 The grave of Bruce Goff in Chicago’s Graceland Cemetery. into the possession of wealthy art collector and Goff patron Joe Price, of Corona del Mar, California. A formal burial never occurred. Finally, in 2000 Seattle architect Grant Gustafson designed a marker, secured funding for it and a burial plot, and brought together Goff aficionados to pay a tribute to the master as he was laid among other greats of 20th century architecture in the Graceland Cemetery at Chicago, Illinois. In the years after Goff’s death his international reputation continued to grow. 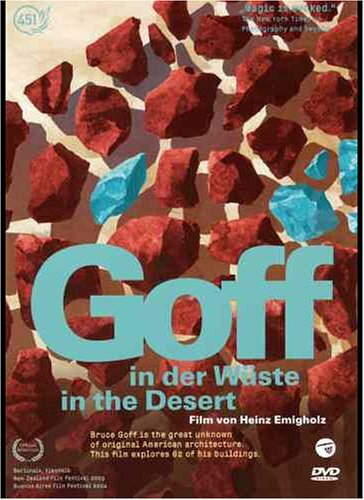 In 2008 German director Heinz Emigholz premiered at the Berlin Film Festival his new documentary entitled Goff in the Desert, which was a look at the work of Bruce Goff. The film showed 62 buildings – from small petrol stations to representative museums – designed by Goff. It was the first comprehensive filmic catalogue of nearly all Goff’s surviving creations. The Dr. Mitchell Home in Dodge City, Kansas, designed by Bruce Goff. Then in June 2008 the prestigious Tate Modern Museum of Art in London, England, sponsored a weekend of Bruce Goff events celebrating the work of the visionary architect. The weekend included presentations and discussion by key figures in the international architectural world as well as the British premiere of Goff in the Desert. 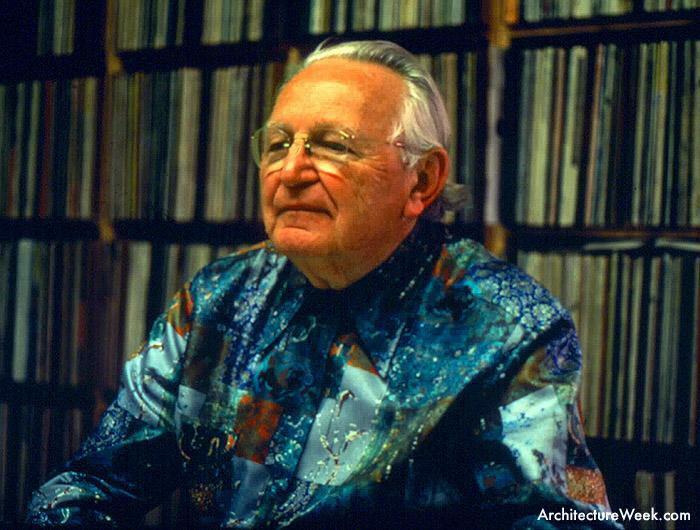 The legacy of Bruce Goff continues to influence architects all over the world as we move forward into the 21st Century. Nicol House, Overland Park, Kansas. 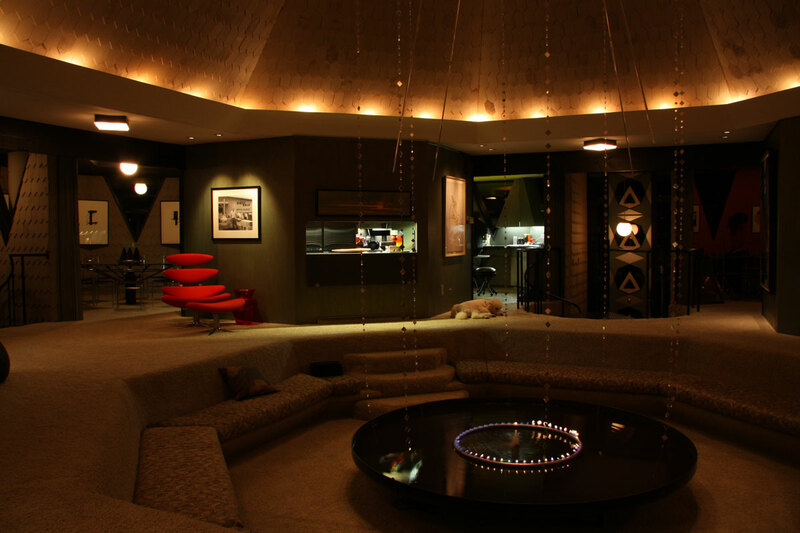 Interior of the Nicol House at night. 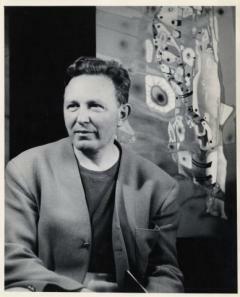 Bruce Goff later in life.